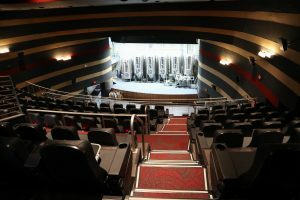 After showing its last film in 1989, the Times Theater has reopened after renovating to include a modern day twist. 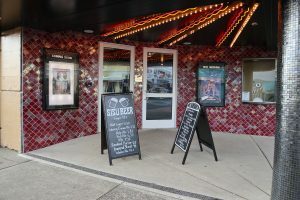 The Times Theater building is one of Seaside’s most historical sites, and is most popularly known for the large vintage mural that it once dawned. The paint that covers the once exquisite mural caused quite the stir-up between locals, and it left many hopeful that it would make a comeback in some shape or form. And after almost 30 years of being used for storage, the once Seaside staple had to undergo some major renovations to be brought back to life. 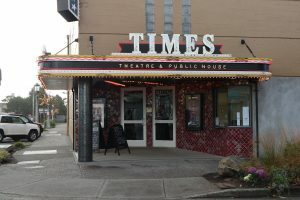 Still standing in its original spot on the corner of Columbia and Broadway, this Seaside classic is now known as the Times Theater and Public House. 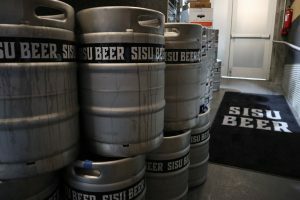 Now, in addition to watching second-run movies, you can catch a Ducks game or sip on one of their house brewed SISU beers. In addition to the beer they brew in house, they have wine, guest beer taps, cider, and a full menu to order from. The theater dawns large, comfy chairs with pull-out tables to accommodate your food and drinks. When ordering off of the pub menu, table service is available for the downstairs theater seats and the larger sit-down tables near the bar. You can order food and concessions or even grab some classic Phillips Candy from the front counter to take with you to the upstairs balcony seating. The interior pays homage to the original theater, leaving the seat layout in tact as well as the unique shape of the building. 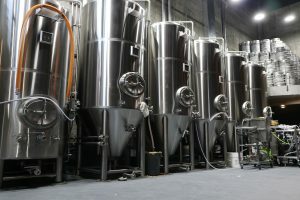 Where there once was a movie screen is now 6 large brewing tanks, multiple SISU kegs, and other beer brewing equipment. 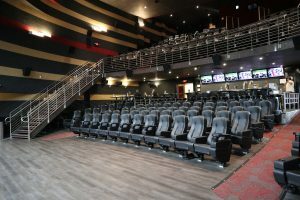 When it’s time to watch a game or movie, they simply pull down the silver screen where the showings can be digitally projected. While there were undoubtedly some major renovations, the new owners did an incredible job of keeping the classic look while tying in the sports bar-esque pub. We stopped in recently to dine and watch the movie “A Christmas Story” . We loved your food that we ate while watching the movie. Tried some of your IPA and it was GREAT!. What a great night of fun. Thank you for bringing the Times back to Seaside. Happy New Year to all of your staff! !!!!! All the girls from Shear Pleasures Salon & Spa would like to request for you to play the movie grown ups.